How's your weekend going? One thing about being on this side of the international date line is, that here in little old Oz, the weekend is well under way. That means I have more time to take off my hat that says 'Taxi Driver and Chief Cook and Bottle Washer' to 3 mostly nice, but very unappreciative people in my immediate life and do something I want to do. Something for me.....Hey that's why I started hanging out with you guys on this blog anyway. It was all supposed to about me expressing my creative needs!!!!! So today I chose to hang out with the Queen of England, and soak the paper off her back and glue her in lines to make her look real pretty. Well the vintage stamps of her image anyway. 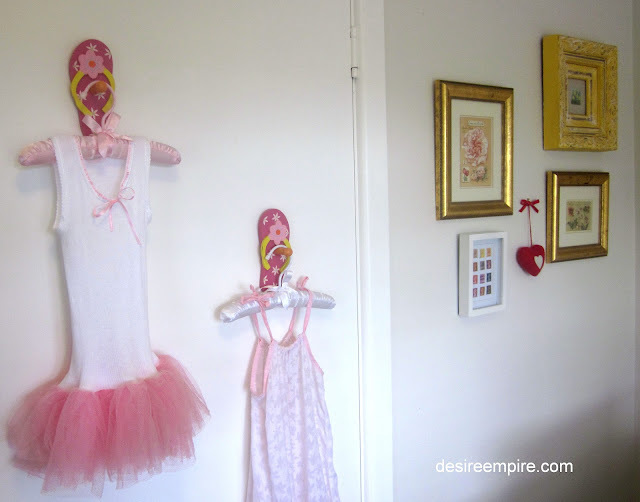 If you've been coming round here for a while, you will have seen the Beach House Brats bedroom re do and the gallery wall I started at the end of her bed. Well today I made some more budget friendly art to go up there. 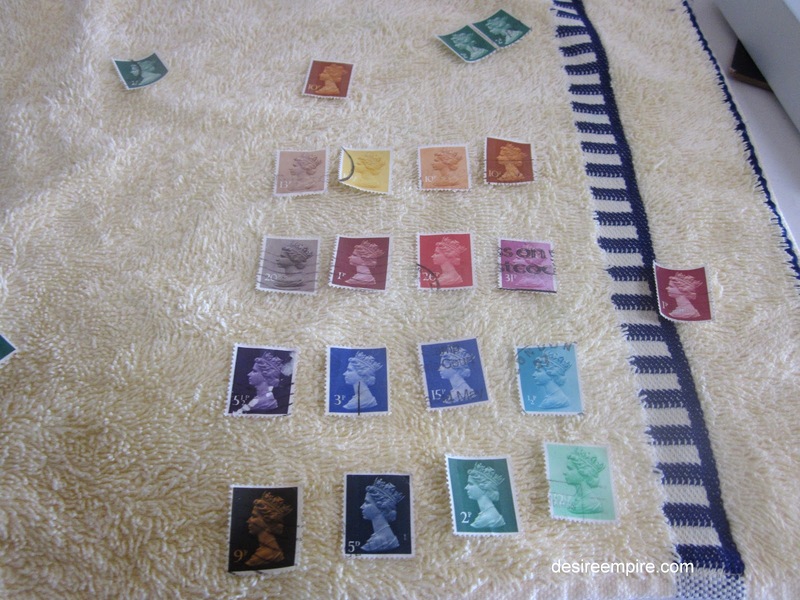 Just before Christmas, I took delivery of a tin of vintage stamps I collected back in the 1970's. They had been lurking at the back of one of mum's cupboards and she sent them over to the Beach House for me to do with them as I wished. I used some of them to make Christmas decorations, but there were lots left over. 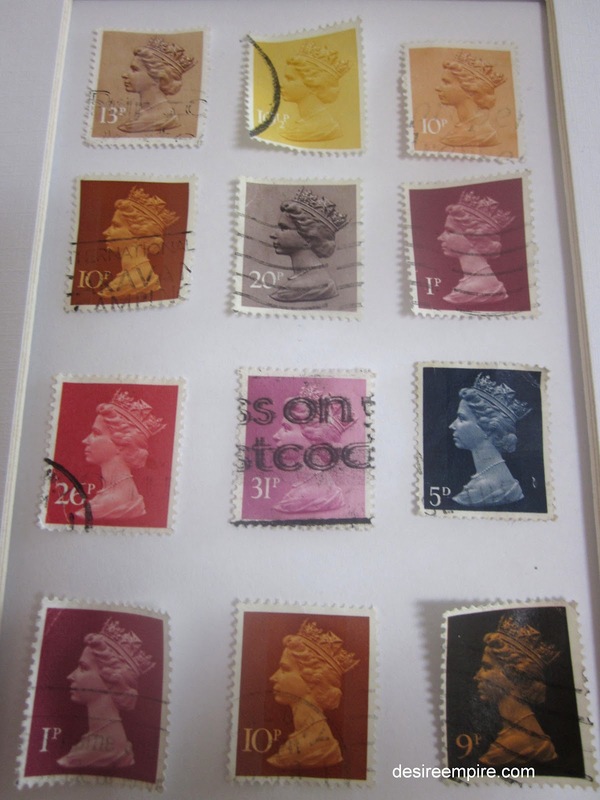 I particularly liked the old stamps of QE2. She is an absolute beacon of style and I was thinking today, they are the only stamps I have ever seen without the country's name on them. The Queen's image is so instantly recognisable, that no names are necessary. I had to soak them off the envelopes and as they were drying, I played around with colour. I adore the aquas and greens, but as they were to be hung in a pink bedroom, I moved back to the other end of the spectrum. I used most of the pink ones at Christmas, so as with most of my decorating, I went with what I had. I played around with the browns and yellows and this is what I came up with, as the best fit for the colours I've got left. 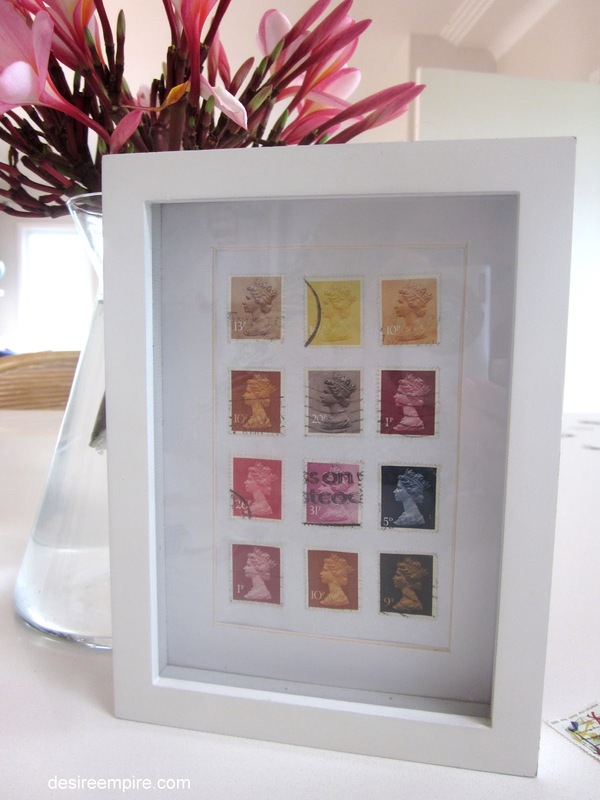 At first I was going to make a heart for a shadow box with the stamps, but I kept going back to the Queen. It seemed a waste to put a flat piece of art in the shadow box, so I used another frame I had hanging around with an old photo, that needed changing out. So my friends, as is quite often the sad and sorry reality round here, out of necessity, I nailed it on price. Yep that's right........free.......my favourite price point. I then placed my newest little artwork next to these lovely frangipani for a bit of a pink hit. My generous Slovakian friend let me take out of her garden the other day. She has a 3 week old baby and asked if she could have my daughter for the day, so her eldest could be entertained. That is something I could never have managed at that stage of the new born game, but hey everyone has their strengths. She doesn't read this blog, so I can tell you she trusts no one with her daughter and most definitely not me. Even though I offered that the girls play here. She has seen my slap dash parenting ways and obviously they don't meet up with her earth mother standards, so her place it was. The girls had a ball, I had more time to be with you and get on with my life in other ways so everyone was happy, and these gorgeous flowers now live at my place......what's not to love? 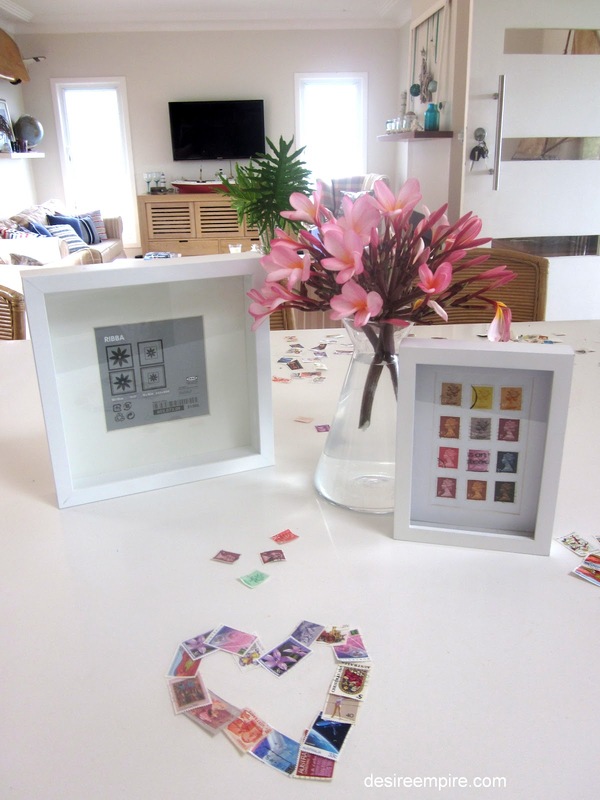 Anyhoo, the stamp art made it into the gallery and I think it looks kind of sweet. You wouldn't want to see the rest of the room right now. It's been raining in Sydney for days now and the Beach House Brats have been house bound, a good word to describe it, would be tip. So that's my 'me time' over. I'm off to razzle to troops, we've got some tidying up to do. I wonder if super mum is available to come over for an hour!!!!! Today I'm partying here for Queen Elizabeth's 60th anniversary on the throne of England. Happy anniversary Liz for your Diamond Jubilee!!!!! !You are a gem!!!! What a clever idea and so thrifty too, that's a win win in my book. The room is coming together beautifully. Super job. Gives off a lot of ideas. Oooh the Queen looks so beautiful, I love the colors. i think i remember those stamps..i must be old! love the frames and a great idea! What a clever idea! I've never thought of that and it's a great way to display them. Terrific job and your room is coming along just beautifully! Happy Sunday. What a great idea!! Thank you for sharing at Sharing Saturday!! We look forward to seeing what you share next week! 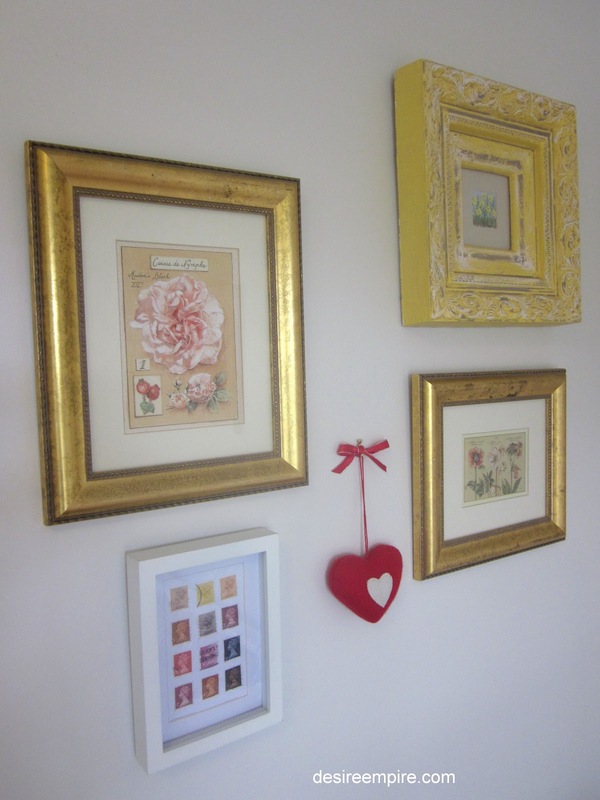 I love the stamps in the frame! What a super cute idea! LOVE it! Thanks for sharing! The stamps look great. Somewhere I have a bunch of old stamps tucked away. What a great application. What a great way to showcase QE2. Love this idea! Stamps have long followed me home from various trips, and if I receive mail with an interesting stamps, those too find a place here rather than going in the trash. I appreciate them as little works of art. Hello, I log on to your blogs daily. Your story-telling style is witty, keep doing what you're doing! 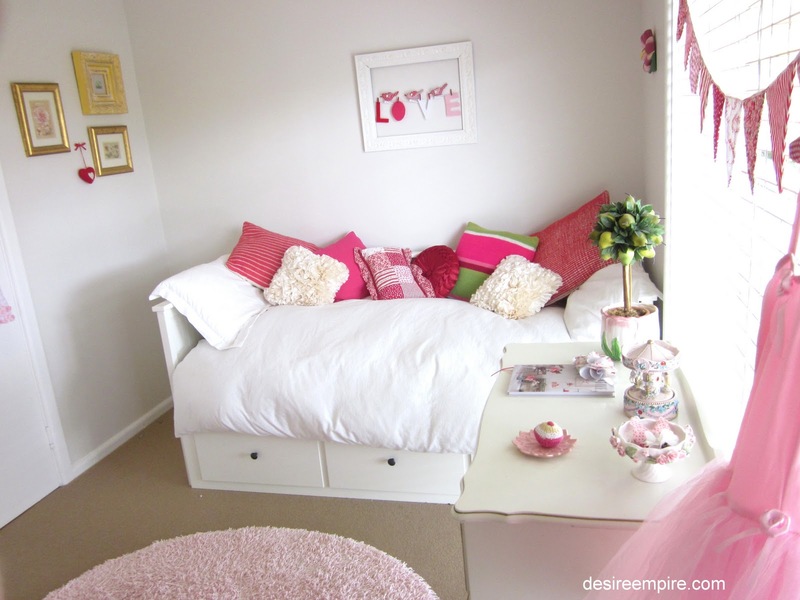 Loving those pops of pink! 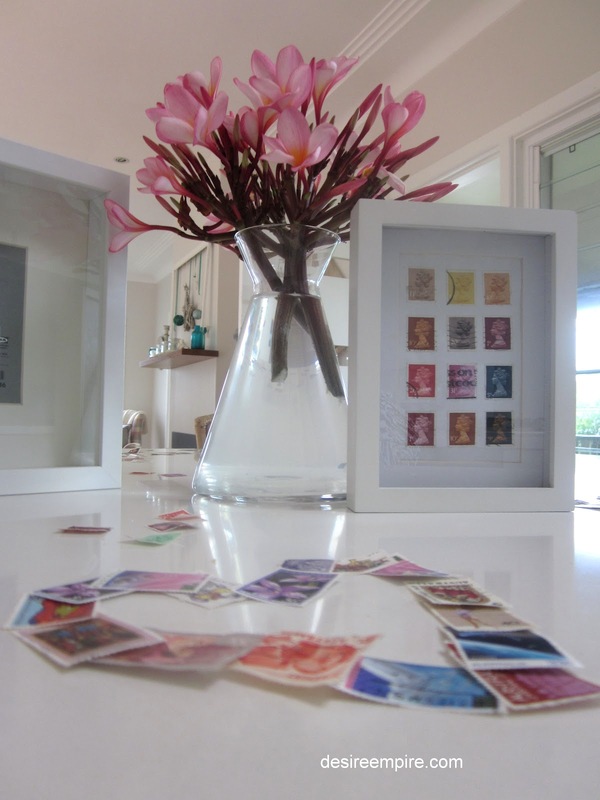 What a great way to display stamps! Just love all the IKEA frames! Wow! I adore the girlie touch. I also love the way you hang your arts. 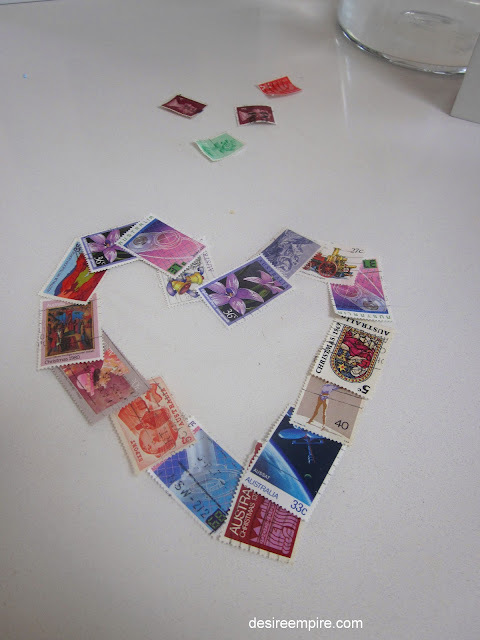 Thanks so much for sharing your great ideas for stamps with us! I inherited my mom's stamp collection and I've got boxes and boxes and boxes ... now I'm all inspired to play! love the stamp art !!! i miss the stamps we could soak off an envelope ... now they're all adhesive stickers and it just isn't the same. i have a jar of old ones to think of doing something with. you've inspired me to get mine out too. 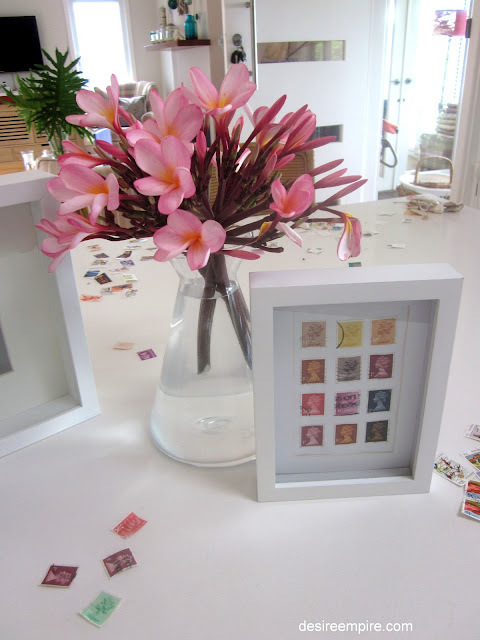 Love this idea and making a stamp themed picture/shadow box! Very cute, and what a sweet room! 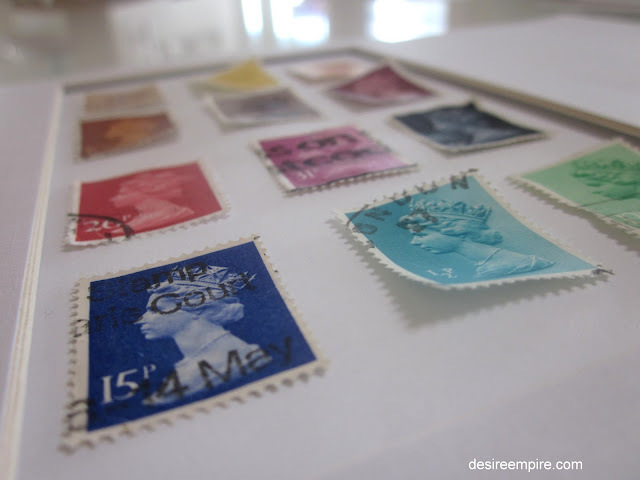 Love the Queen stamps, they look so nice! Oh now I wish I had some stamps!! I'm going to have to go looking now. I just love how it turned out. Simple, yet elegant. Happy Pink Saturday. As a brit in the US I love this! I'm sharing it on my blog and FB page - you rock!